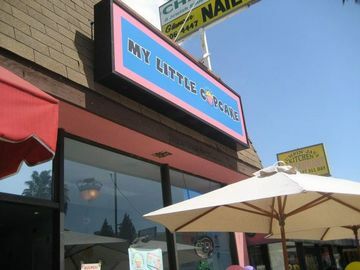 My Los Angeles Cupcakes Meetup Group headed to My Little Cupcake in Studio City this past weekend. I had heard mixed reviews and I think in the end we were still mixed. The strawberry cupcake was very moist and we all liked that it had real strawberry bits inside. The other cupcakes though were a bit dry or at least not as moist. Besides their big cupcakes they also sold mini ones for only $1.00, which is cool. Their Hi Hat cupcake is interesting, it has a marshmallow on top and the entire chocolate cupcake is dipped in chocolate. Other members liked their red velvet cupcake, Bugs Bunny (organic carrot cake) and their Reese's one. The owners come from Israel and say they have been around for a year and a half now, but baking for four. There are tables outside, but it was a windy day and their balloons tied to the chairs kept hitting us. (Photos). 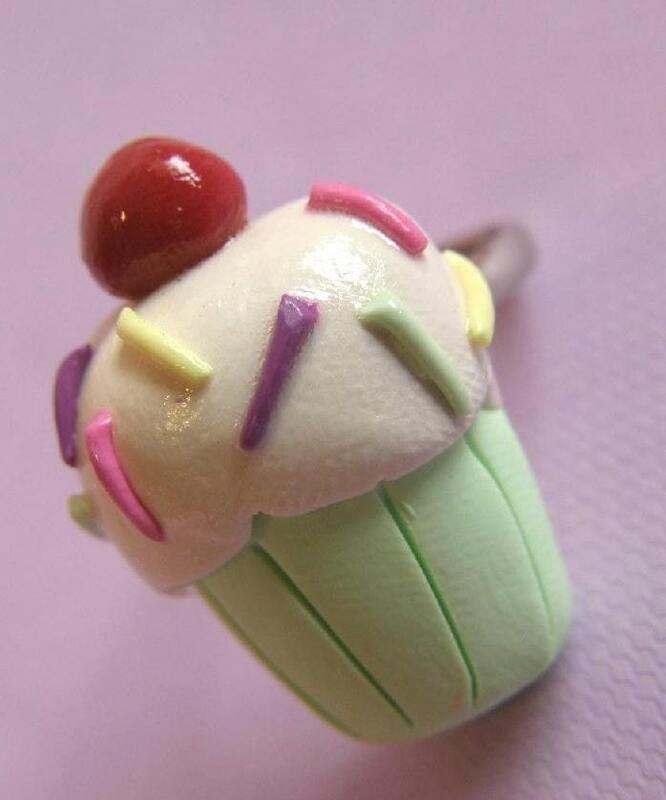 One of our newer group members, Laura, also designs cakes, you can check them out at Cakes by Mom. PS: Top 50 Los Angeles Blogs -- guess who is number 10!? Also, pretty please vote for me as Best Lifestyle blog in the Glam Network Awards. Thank you! PPS: I just rode the elevator with actor Grant Show from Melrose Place. His hair was a bit longer and he looked tan and comfortable in jeans and a tight dark tee. He's looking older, but sexier too. I had jumped into the elevator just as the doors were closing and nearly collided with him. As I did, I was like, "he looks familiar." Then it came to me as we rode the next few stories together. He was talking with another guy, his agent/publisist perhaps? I was hoping to make it to this meetup, but I just couldn't swing it. I had been there before and wasn't all that impressed, so I didn't feel so bad about it. I can't wait to find out about the next one. Red velvet cupcakes? Droool. Congrats on the top 10 blog! I voted for you! Congrats on getting #10! Congratulations! Wow, #10 is huge! I just voted, too. I was in LA for two days this weekend and I was all set to surprise you by showing up at My Little Cupcake, but it didn't work out. :( I was so bummed not to see you. Karen!!! OMG I'm mad that you didn't, you so shouldn't have even told me you were here, now I'm really bummed I didn't see you. Sneaky girl. Thank you all for the votes and congrats! Top 10 Tara! I can totally say "I knew you when...."
Nothing like being in the top 10!!! Very Cool. Congrats! Congrats on the top 10!!! So cool! I voted for you on Glam. Good luck! BTW, I used to looooove Grant Show when he was on Melrose Place!